Home / GST-Tally / TallyERP.9 Lessons / How to Create Sales / Purchase account in Tally for GST? How to Create Sales / Purchase account in Tally for GST? In TallyERP.9 Release 6.0 (Beta) you can create Sales / Purchase ledger integrated with Goods & Service Tax. In this tutorial we learn about how to create both ledgers. In previous post we know about how to Setup GST (Goods & Service Tax) compliance in Tally.ERP9. You can only integrate GST Sales & Purchase, when you successfully integrate GST Taxation Compliance in Tally.ERP9 Release 6.0 otherwise your data will show all the time taxation or mismatch error. 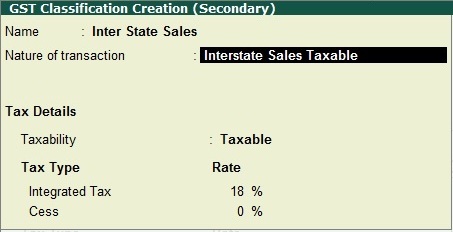 If you select yes then a new window will appear on your screen to enter the details of Inter State Sales Ledger. Enter name as Nature of Sales whether it is Local / Inter State or Exports. Nature of Transaction will be selected from predefined nature of Transactions from right side list. Select Taxable/ Exempt or nil rated. 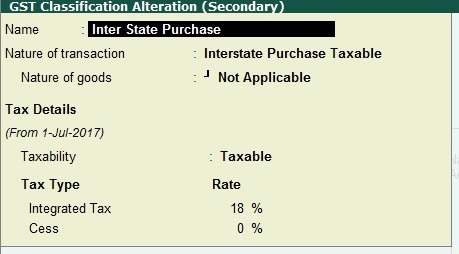 Enter the required tax rate and press Enter to save the details. 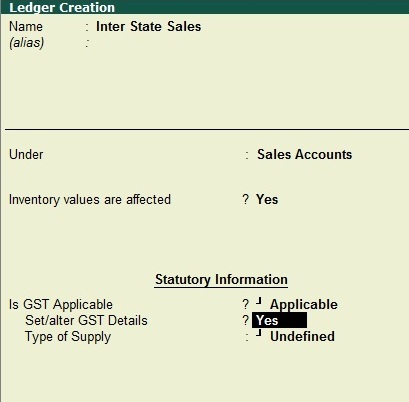 Now you are again on Sales Ledger creation screen, Now select type of supply which is you provide, Goods or Services. Press Enter to Save the Details. In the name field, Enter nature of purchase, nature of transaction is predefined option, to be select from right side panel, nature of goods Select capital goods if required, Taxability is Taxable, Enter required rate and save the details. You are again come to Ledger creation details, Select type of supply as Goods (if you supply goods otherwise services). Press Enter to Save the details.